Transparent powder has a blurring effect that eliminates the look of fine lines with a touch of sheer coverage. Two shades designed to work on any skin tone. Micronized pigments won't settle into fine lines, accentuate shadows or look cakey, even in the eye area. 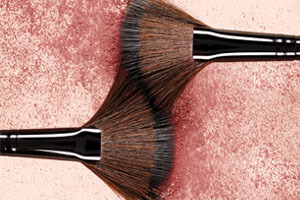 Using the Camouflage Powder Brush, pat over makeup or onto lids; don't drag the brush over skin. Mica, Diphenyl Dimethicone/Vinyl Diphenyl Dimethicone/Silsesquioxane Crosspolymer, Sorbitan Isostearate, Polysorbate 60, Talc, Glycerin, Ethylhexylglycerin, Chondrus Crispus Extract, 1,2-Hexanediol, Xanthan Gum, Tin Oxide, Caprylyl Glycol. May Contain/Peut Contenir/(+/-): Titanium Dioxide (Ci 77891), Bismuth Oxychloride (Ci 77163). (Ci 77947).